Just this last week there was a very rare Disneyland postcard up for auction on eBay. There was a reserve on the card, and it had a number of bidders…but the reserve was not met at $113. 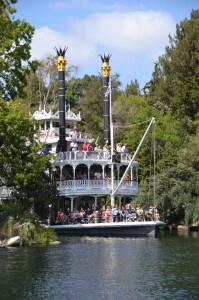 The card I am speaking of is NT0088, the black and white card of the Mark Twain river boat. These cards are rare…there is no doubt about that. I have seen them on eBay only on rare occasions…and it’s been a long time since I saw one last. Tonight, the card is back up on eBay with a “Buy It Now” price of $175. I want to make an editorial comment here, but I will leave you to form your own opinions. I won’t be bidding on the card. That’s not to say that it couldn’t be bought “now”…maybe some collector who has not been paying attention over the last week and who needs this card to complete the set will discover the listing. Either way…I wish the seller well. In the mean time…check out this photo of the Mark Twain I took last week. Still fantastic…60 years on! This entry was posted in Disneyland Postcards and tagged Disneyland, Mark Twain. Bookmark the permalink.